Posted on March 28, 2019 at 6:15 am. What’s a yearly practice that can make you a better person and only happens every spring? It’s not tax day: it’s Slow Art Day, and it’s coming up! Take it in and take it slow this Slow Art Day. Slow Art Day falls on April 6, 2019. Image c/o pexels.com, credit Una Laurencic. Today’s world moves pretty fast, and the art world is no exception. Phrases like museum fatigue (the exhaustion you feel on trying to look at all a museum has to offer in a short amount of time) have entered the vernacular, proving that sometimes we as a society tend to prioritize quantity over quality when it comes to interacting with art. (I.e. : did I hit absolutely every room and floor at the Met during my visit today? Check!, rather than finding a handful of artwork and really connecting with it.) And of course we’ve all done this, as it’s only natural to want to soak in as much culture as possible when visiting a museum or gallery. Slow Art Day seeks to force us to slow down and really look at artwork and spend time with it. It’s amazing how many details you can pick up on the more you look at a piece, and Slow Art Day focuses on getting viewers to connect with artwork. Some galleries and museums (like the National Portrait Gallery in Washington, DC did last year) encourage viewers to record their impressions from the pieces they’re drawn to so they can meet up with museum staff and other participants afterward to discuss their experience. And to jazz things up even more, some institutions (like the National Portrait Gallery did) even offer special activities for viewers of all ages, like writing exercises and music, meant to tie in with what viewers experienced. However, you don’t necessarily need to visit one of these places to celebrate Slow Art Day. 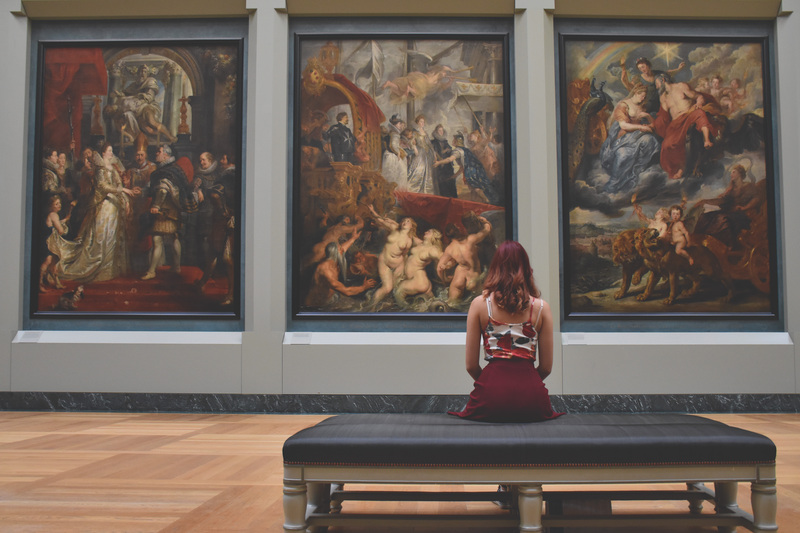 You can just as easily create your own experience by going to a local museum or galley and interacting with the art there with that same slow mindset and even inviting a few friends along. Slow Art Day is all about connection, with art and with other art lovers, and we’re looking forward to it! Discover more about Slow Art Day at their website, Facebook page, and at the National Portrait Gallery’s blog. What do we do here at the Art Docent Program? Discover more about us and our curriculum here! Want more fun articles on art happenings? Check out our blog archives for more! Don’t forget to follow us on Facebook for updates and art history posts!